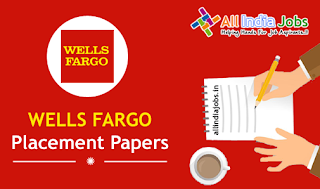 Wells Fargo Placement Papers PDF Download 2017-2018 | Aptitude, Reasoning & Verbal Ability Model Papers. Candidates who are interested to get placed in Wells Fargo, they have a good news. In this page, we have provided the latest placement papers of Wells Fargo. In this article, we have discussed questions and answers based on aptitude, reasoning & verbal ability to support the candidates who are looking for Wells Fargo Placement papers. This is the correct place to start your preparation for the Wells Fargo Recruitment written test. Interview Questions and previous papers also play the crucial role for the preparation of Wells Fargo recruitment. Contenders can practice these placement papers to get good marks and get qualify in the written test. In Wells Fargo placement Papers, you will get to know the pattern of test and model Questions. By these Placement papers, you will get an idea about the Wells Fargo Exam pattern and it becomes easy to achieve their goal. We also provided the questions and answers based on the Aptitude, Reasoning & Verbal Ability in this article. We suggest the candidates prepare well for the Wells Fargo examination. Candidates can check out the Wells Fargo Test Pattern, placement papers, interview questions and find out how much they score before you appearing for the examination. Candidates should practice the previous papers of Wells Fargo according to the test pattern. This will help them to analyze in which area they are weak and have to work hard to achieve their goal of clearing the written exam and move to next rounds. Aspirants can check the latest updates to our site by makiking bookmark (Ctrl + D). Candidates who are preparing hard to get a place in the Wells Fargo recruitment test, they can check the aptitude test questions and answers given below. We suggest the aspirants practice these questions and answers. 1. Two trains of equal are running on parallel lines in the same direction at 46 km/hr and 36 km/hr. The faster train passes the slower train in 36 sec. The length of each train is? Let the length of each train be x m.
Then, distance covered = 2x m.
Relative speed = 46 – 36 = 10 km/hr. = 10 * 5/18 = 25/9 m/sec. 2x/36 = 25/9 => x = 50. 2. A man sold 20 articles for Rs. 60 and gained 20%. How many articles did he buy for Rs.60? 4. Find the mean proportional of the following pairs of numbers 50 and 512. 5. The simple interest on a sum of money will be Rs. 600 after 10 years. If the principal is trabled after 5 years which will be the total interest at the end of the tenth year? 6. 12(13/18) + 16(11/27) – 10(5/9) = ? 8. 12 men can complete a piece of work in 4 days, while 15 women can complete the same work in 4 days. 6 men start working on the job and after working for 2 days, all of them stopped working. How many women should be put on the job to complete the remaining work, if it so to be completed in 3 days? 9. The sides of a cube are in the ratio 1:2 the ratio of their volume is? 11. Sam purchased 20 dozens of toys at the rate of Rs. 375 per dozen. He sold each one of them at the rate of Rs. 33. What was his percentage profit? 14. How much time will it take for an amount of Rs. 450 to yield Rs. 81 as interest at 4.5% per annum of simple interest? 15. If a – b = 3 and a2 + b2 = 29, find the value of ab. Try these Wells Fargo Reasoning Test questions and answers which are provided along with the solution. Do practice these questions to get qualify in the Wells Fargo written test. 1. A tree always has which of the following? Which of the following symbol should replace question mark (?) in the given expression in order to make the statements ‘F > C’ and ‘B < E’ definitely follow? 3. Statement: Greater public participation results in good civic governance. – Statement of Municipal Commissioner of City A.
I. The municipal office is not competent to effect good civic administration. II. Good civic governance is a matter of collective will and effort of the people and administration. general public lends a helping hand in the same. So, only II is implicit. 4. Statements: The standard of education in private schools is much better than Municipal and Zila Parishad-run schools. I. The Municipal and Zila Pariskad should make serious efforts to improve standard of their schools. education of these schools. So, only I follows while II does not. 5. Statement: Should fashionable dresses be banned? I. Yes. Fashions keep changing and hence consumption of cloth increases. II. No. Fashionable clothes are a person’s self expression and therefore his/her fundamental right. 6. Select the most appropriate alternative as the answer. : While firing crackers, a child gets severs burns on the hand. What would you do? A. Dip the child’s hands in cold water till there is no more burning sensation. B. Wash the hands with dettol. C. Send someone to call the doctor. D. Apply some ointment on the affected area. 7. 20, 20, 19, 16, 17, 13, 14, 11, ?, ? When we go through input to step I, we find that the largest number because the first and remaining numbers shift rightward. In the next step the smallest number becomes the second and the rest shift rightward. These two steps continue alternately untill the two alternate series are formed. Last step can be known directly. 9. The letters L, M, N, O, P, Q, R, S and T in their order are substituted by nine intergers 1 to 9 but not in that order. 4 is assigned to P. The difference between P and T is 5. The difference between N and T is 3. What is the integer assigned to N ? 10. Look at this series: 36, 34, 30, 28, 24, … What number should come next? The digits in 32 are written on either side of P.
R-6 is L. L is 12th letter and 12 * 2 = 24 => 2L4. => W > B and W > M. Hence, both conclusions (W > B; M < W) are true. 15. ATTRIBUTION, TTRIBUTIO, RIBUTIO, IBUTI, ? At each step, 1, 2, 3, . . . letters are removed from the beginning and the end alternatively. Contenders can practice these English test Model Papers along with the preparation of Wells Fargo recruitment test. These will be helpful for the applicants to crack the test of Wells Fargo. 1. He was only joking, as he ______ many times before. 6. Freedom and equality are the ….. rights of every human being. 8. I was walking _____ the street when two boys ran _____ me. 10. She was not aware of ______ she had said earlier. C. the custom still prevailed among some groups in India. 13. I want to eat ________ apple. 15. The cheetah is .. animal. We hope the above provided Wells Fargo placement papers are helpful for the candidates. For all the latest latest updates for every company placement papers visit our site regularly. Contenders stay tuned to our site for more fresh updates.